When the Porters start receiving Earth T.V. broadcasts, they suspect a portal has opened…but they instead find their old San Francisco neighborhood in the middle of the jungle. Many fans (by many, I mean me) consider this to be the best episode of LOTL90. It's a lot of fun and even has a bit of an homage to LOTL70 in the form of the pylon shape and crystal table comprising the ancient dreammaker device left behind by the Sleestak civilization. As Tom lays sleeping in bed, he starts to hear the sounds of Earth civilization in the night: a jet airplane flying overhead, traffic with car horns, a siren; all caused by the dreammaker device. Was Tom already dreaming these things and his brain waves were picked up by the dreammaker? At 0:34 in the episode, we hear a police siren and see flashing red light reflecting over Tom, then we hear a car door open and close. Tom gets up to investigate, but the sounds and lights have vanished. 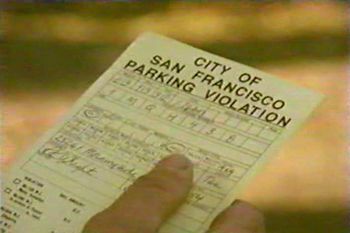 In the morning, Tom finds a parking ticket on the Jeep; why would a cop have his siren and police lights on just so he could drive up and write a parking ticket? In a real world scenario that wouldn't make sense, but in a person's dream it might happen. At 2:21 in the episode, a tremor strikes and Tom comments "it's just an aftershock from yesterday's quake." Then the family simply continues about their chores. Given the events of past episodes (see "Day for Knight" and "Flight to Freedom"), wouldn't the Porters, whenever a quake is felt, immediately check their portable TV for interference, indicating a portal has opened nearby? The parking ticket the Porters find on the Jeep is a lot of fun for sharp-eyed fans. The ticket also has the correct license plate number of the Porter's Jeep, as shown in the first season episode "Flight to Freedom", 1MQH238. The signature of the issuing officer reads R. Wright. Richard Wright was the prop master on the show! 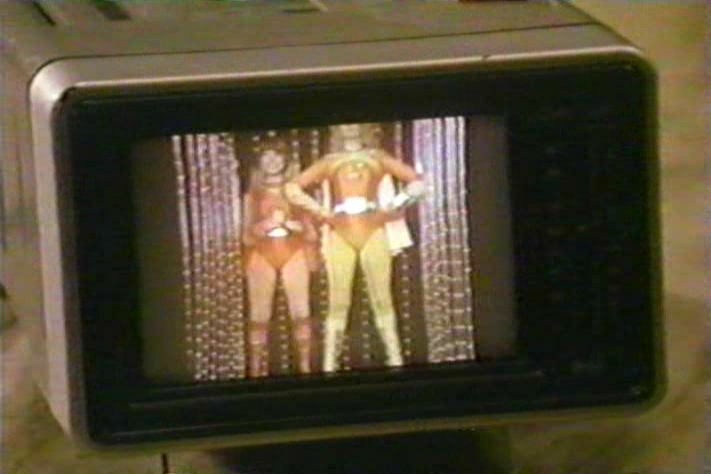 Kevin's portable TV starts to pick up an Earth broadcast of Kevin's favorite show, The Turbo Twins. 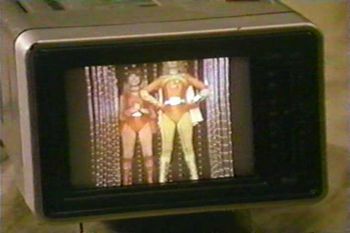 At 5:13, we can clearly see that the scenes shown are actually from the Krofft's own 1976 Electra-Woman and Dyna-Girl show! When the Porters decide to search for a possible open portal to Earth, they worry about Christa's whereabouts. Tom says "Don't worry, we won't leave without her." Did they forget that Christa had already stated in "Flight to Freedom" that the Land is her home and she will stay? Stink says that Christa has gone hunting and will be gone for two days. Is this why she has also been MIA in the recent previous episodes, i.e. she has a habit of going hunting over a period of several days? At 7:10 in the episode, the Porters see a Parasaurolophus and Annie states, "It's Mama Two-Legs." Kind of a strange name to drop in without explanation for a dinosaur individual we've never seen before. Is she called Mama because they know she has babies somewhere? And why add Two-Legs to the name? Paleontologists have determined that the species spent part of the time walking on all four legs, so perhaps the Porters have noticed that this particular individual prefers to move around on two most of the time. After they've discovered their Earth neighborhood in the middle of the jungle and decide to enter their house, they apparently find the door unlocked. Later in the evening, after returning to the tree-house, Kevin comments that everything in the Earth house was just like they left it. So, are they in the habit of leaving on vacation without locking the front door? That should have been the first tip-off to them that all wasn't as it seemed. At 9:39 in the episode, Kevin and Tom look at a family portrait that was sitting on a shelf in the home's living room. The three family members "coincidentally" all have their second season hair styles in it! What is the Porters' favorite cereal? Well, when Kevin goes into the kitchen, a box of Honey Bunches of Oats can be seen on top of the refrigerator. Kevin also seems to be partial to the ice cream snack called a Drumstick; he pulls one out of the freezer and feeds it to Tasha, which she seems to swallow whole. Ice cream headache, anyone? As far as other recognizable food brands in the kitchen, there appears to be a can of Reddi-Whip and a jar of Grey Poupon in the refrigerator door. Other brands are not identifiable. On the first day, the refrigerator light appears to be out. It doesn't come on when Kevin opens the refrigerator door. But the next day as Tasha is raiding the fridge, there appears to be a light on inside. I think the real answer is that the refrigerator was a non-working one brought in for the shoot. On the "second day" of the Porters' visit, as the house turns against them, vegetables and containers start flying out from the fridge, so there is probably a false back to it that was removed for the flying vegetables scene and it is light from the other side that we are seeing. At 12:07 in the episode, Tasha appears to be drinking a bottle of ketchup! Although the events are different, when the house turns against the Porters, I am reminded of the Poltergeist house. At 14:47 in the episode, Kevin and Annie receive a phone call from their dead mother! Although uncredited in this episode, the voice does sound like the same actress, Marta DuBois, who plays Natasha Porter's doppelganger in the later episode "Siren's Song". Back at the tree-house, after a bad experience with plastic fruit at the Porter home, Stink squeezes a grape to ensure its authenticity. Satisfied the grapes are real, he throws the squeezed grape on the floor and plucks a fresh one from the bunch. Considering he is willing to eat bugs he picks off of himself, couldn't he have eaten the crushed grape instead of wasting it? And speaking of Stink in the tree-house, didn't Tom decree (in "The Thief") that the Paku should only enter when someone was home? Yes, it turned out that the thief in that episode was a pterodactyl and not Stink, but it still seems like a generally good idea to not have your friends in the house without permission when you're not there! As Stink sits in the tree-house eating grapes, he turns on the portable TV and sees the events now occurring at the house as the house attacks and traps the Porters. Why would the dreammaker show this to him? I guess it was reading Stink's thoughts just as it was the humans' and Stink must have been wondering what the Porters were up to. Seeing the Porters in trouble on the TV, Stink races to help them. The neighborhood must not be very far from the tree-house because he arrives very quickly while the human family is still fighting off the same menaces of furniture and, in Tom's case, the garage door. The scene from 18:55-19:22 is the coolest in the history of LOTL90. Pre-dating the second Jurassic Park film by 5 years, Scarface comes stomping and roaring through the residential neighborhood, tipping over a parked sports car and ripping off the passenger door with his teeth before flinging it away. When our heroes run into the dreammaker cave, the humans all start to get splitting headaches due to the proximity of the device. It doesn't seem to affect Stink, which is odd since the dreammaker seemed to "interact" with him by showing him the images of the Porters on the TV earlier. At 20:35 in the episode, Tom comments that the Sleestak were on the surface "centuries ago." How does he know it's been centuries? 7:43 Stink says, "Malu!" "Bad!" 12:27 Stink says, "Malu nabuca. Lazonga." "Bad banana. Apple." 17:20 Stink says, "Malu." "Bad." 20:18 Stink says, "Malu. Malu." "Bad. Bad." 20:30 Stink says, "Malu." "Bad." Obviously designed by the Sleestak long ago, Tom speculates that the dreammaker was meant to trap intelligent beings. But is that correct? How was it intended to trap? Once it had lured them in would the Sleestak be waiting to capture them? Why does the illusion turn against the Porters at the end? Is it because the dreammaker was running beyond its programming in which the entrapped sentients should have been captured by the Sleestak by now? Might the dreammaker not be a trap, but a sort of recreational device for the Sleestak, like the holodeck of Star Trek: The Next Generation? The turning of the illusion against the Porters may have just been a malfunction (again like the holodeck!). The conversation the Porters have after escaping may even lend credence to this theory of the dreammaker as a recreational device; Kevin comments, "No wonder 3D movies never caught on!" to which Tom replies "Yeah, too much of a good thing!" When our heroes enter the dreammaker cave, Stink indicates he is not familiar with it. The cave does not appear to be hidden at all, so how could he and Christa have missed it after living in the area most (or all) of their lives? Possibly the dreammaker was dormant but with some kind of projection of camouflage over the mouth of the cave and when the earlier quake reawakened it, the illusion was dispelled and the dreammaker began it's "normal" functioning again.